I’m going to call this box “the best of the basics.” While I don’t subscribe to Sephora (or any subscription box service) to get makeup basics, as I discussed in my last Ipsy bag review, I do appreciate that in this box, Sephora did the basics really, really well. This is what makes me love the Play! by Sephora box more and more with each passing month: They choose their themes carefully and really follow them through. The products make sense together. (Of course, this is harder for Ipsy since they have so many possible product combinations in any given month, so I don’t hold them to as high of a standard for keeping to a theme.) So while these products on the surface were not the most exciting–moisturizer, black eyeliner, clear brow gel–many are the most hyped products in that particular category. I do appreciate having the chance to try them out to see if they’re really as great as everyone says they are. So let’s get into the review! In the last few boxes, Sephora has included one of their own products among the five. I have mixed feelings about this, especially since I wonder if they’re setting up a pattern that will continue in future boxes. 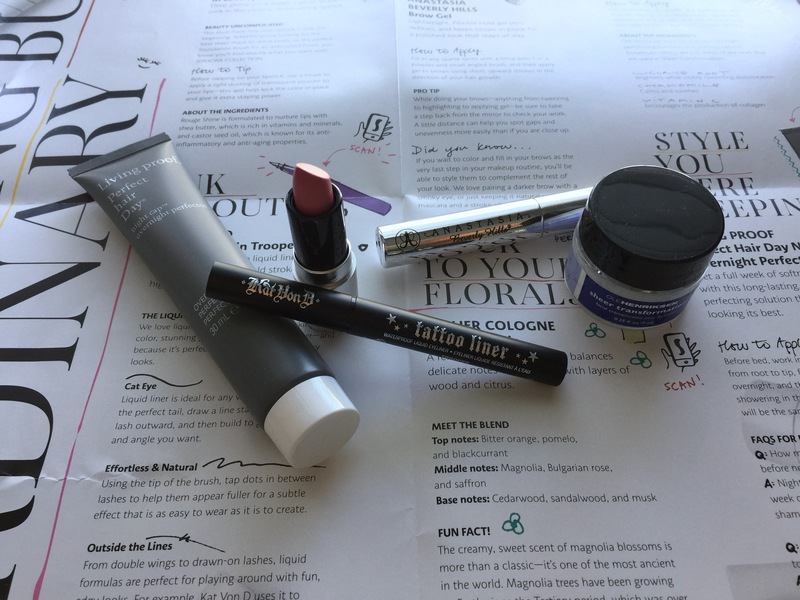 I have really liked both Sephora Collection products I’ve received–a gel eyeliner last month (which I happen to be wearing today, actually) and a lipstick this month. Both have made me want to buy more of that particular product, and since Sephora’s in-store brand is a bit more affordable than many of their other products, this satisfies my frugal side. At the same time, however, I subscribed to this service to try five new products from different brands every month. It doesn’t allow for the variety I was hoping for, and it’s not really fair to subscribers if one brand will always be the same, no matter what that brand is. And when it’s Sephora’s own brand, it feels too overtly self-serving. Sure, the whole box is essentially an ad for Sephora’s stores, but for any brand Sephora sells, not just one line. And while it may seem like a minor distinction, I’d guess it’s an important one for subscribers. I’d love to know your thoughts on this emerging pattern! 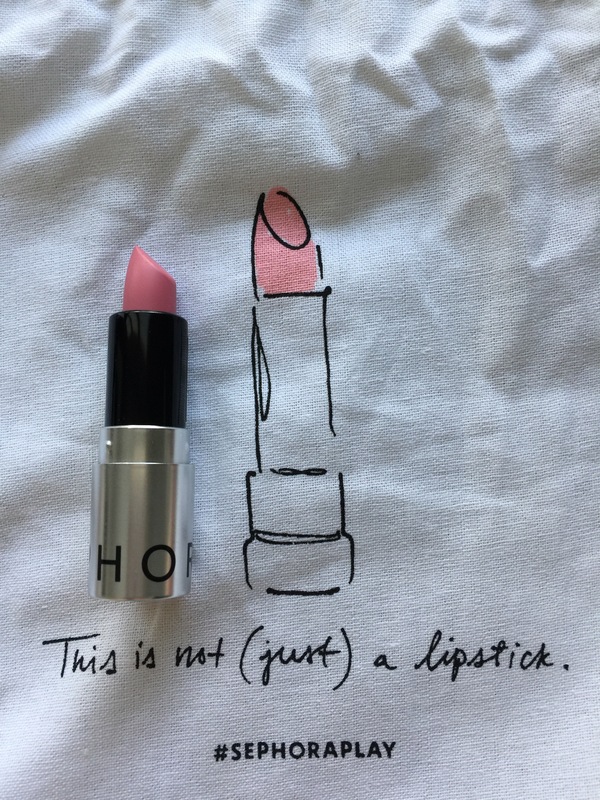 The lipstick itself is fine–a little waxy, but a nice cool pink. I would check out more colors in this line. It’s just the potential pattern this lipstick represents that has me concerned. I guess we’ll see in the next box if this continues! Since it’s the best brow gel I’ve used, you might be thinking that of course I’ll say I’d purchase a full size. Not so fast. My ultimate assessment has to be based on my own brow needs: My brows are not particularly thick or unruly. They tend to be pretty well-shaped near my nose, but get a bit sparse as they go out, so a good brow pencil to fill in gaps is a little more essential for me than a gel to hold them in place. And a full size tube of the Anastasia clear brow gel retails for $22. The other two clear brow gels I use are from Elf ($2) and Ulta’s in-store brand ($6). So even if it’s the best, is it worth $16-$20 more than the others in my collection, or would I rather save that $20 to spend on a high end product that has more of an impact factor for me? I’ve done a more detailed post on this test, but suffice it to say I think the Anastasia Clear Brow Gel is totally worth the price IF you have thicker brows that don’t hold well with other gels. If your brows are thinner or more sparse, or if they already tend to have a shape you’re pleased with, I think you’re fine to go with a less expensive clear brow gel. 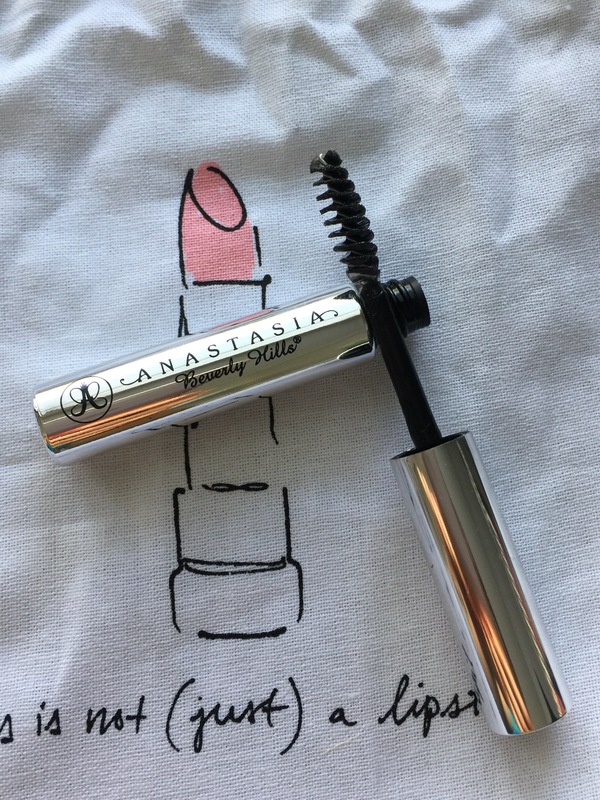 I definitely recommend the Ulta–it is nearly a dupe for the Anastasia. Kat Von D Tattoo Liner in Trooper (Matte Black): This is the easiest liquid liner I have ever worked with, hands down. I don’t wear liquid liner often, which you might think would make me suggest that it is more cost effective to buy a less expensive product. In this case, however, I’d actually be willing to spend more for the Kat Von D liner, for this reason: Since I don’t use it often, I don’t get a ton of practice creating precise lines or wings. This liner made it so easy, even for a novice like me. Less expensive liners I’ve used in the past were difficult to work with, made a mess, and I ended up getting frustrated and having to wash off my eye makeup and start again. Since my skill hasn’t really changed in this department, I think the eyeliner makes the difference. This one glided on easily, created a precise line and wing, and was very buildable. It made me want to try liquid liner more often. When I run out of the sample, I will likely purchase a full size product, which retails at Sephora for $20. Note: Despite being waterproof, it came off easily with soap and water or makeup remover. But I wore it on a rainy day and it did not budge. I do recommend Elf’s Makeup Remover Pen ($3) if you are new to liquid liner–it just allows you to clean up any mistakes very easily and without removing your other eye makeup. 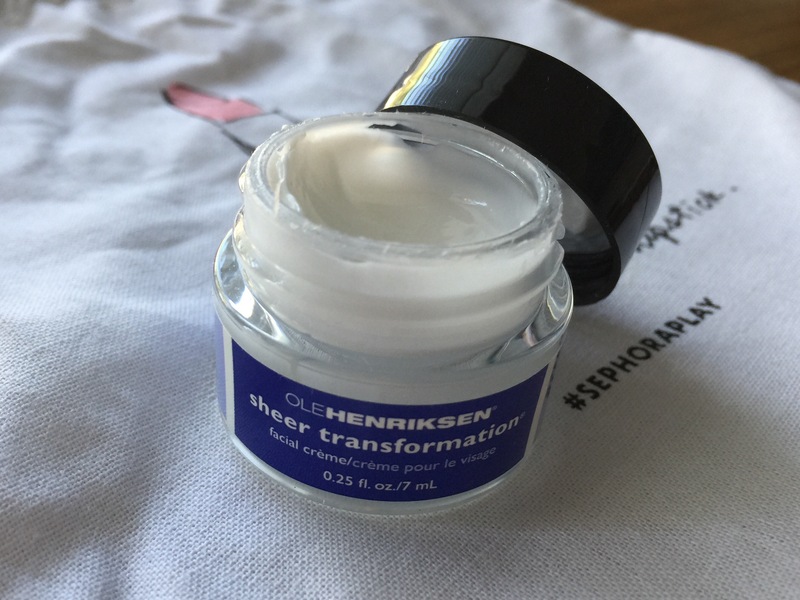 Ole Henriksen Sheer Transformation Facial Moisturizer: This is a small potted daily facial moisturizer. It also says it can serve as a makeup primer. That’s great, but I sort of feel like any facial moisturizer could make that claim. I mean, before primers were a thing, didn’t every moisturizer serve as a primer, in the sense that you put it on before foundation to smooth the skin? The Sheer Transformation moisturizer doesn’t claim that, as a primer, it helps makeup last longer, or fills pores or fine lines, just that it provides a smoother canvas for makeup. I’m not saying it’s not a good product, but that maybe we should not get too excited about its claim to double as a primer, since it doesn’t really say what it does to fulfill that role other than be a good moisturizer. So it’s good, but if I want a primer effect, I’ll use a primer. I don’t feel like this does more than my current daily moisturizer. For $38 for 1.7 oz, or $65 for 3 oz, I most likely won’t purchase a full size. 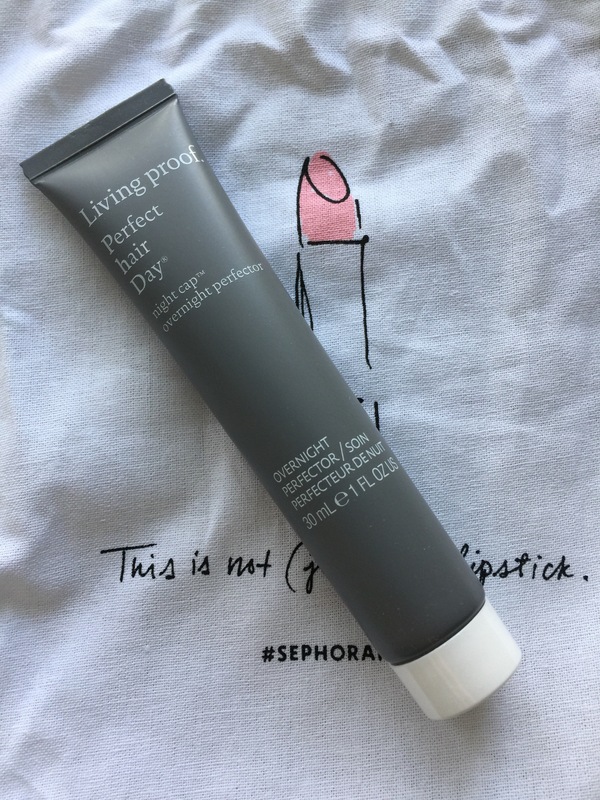 Living Proof Perfect Hair Day Night Cap Overnight Perfector: This is a nice hair treatment that can be used on dry hair and shampooed out in the morning, or used on wet hair after shampooing as a leave-in conditioner. I used it after washing my hair, since I tend to shower at night and love using leave-ins. It worked well: My hair was soft in the morning, and it maybe felt a little fuller than usual, but it did not necessarily perform better than some of my other leave-ins. It also had a scent that verged on medicinal, so it wasn’t as fresh-smelling as I’d hoped it would be based on their dry shampoo, which smells so clean and amazing. It says it keeps hair soft up to five washes (or a full week) after application. My hair did seem particularly good this week, so it might have been this treatment, although I did also use the Hairgurt (good product, awful name) from this month’s Boxycharm, and to be honest I think that performed better. So I probably won’t purchase a full size of the Living Proof Night cap, but I do think it’s a good product. It retails for $28 for 4 oz. For comparison, my staple It’s a 10 Miracle Leave-In Conditioner is $14.99 for 4 oz. Scent: Atelier Cologne Sud Magnolia: I’m telling you, this brand is winning me over. I adored their Orange Sanguine, which came in my first Play! box. If I closed my eyes I could imagine myself sipping champagne on a balcony in Paris. The Sud Magnolia is obviously far more floral, but again it is just so true-to-scent, in the sense that I feel like I’m standing under a magnolia tree, breathing in the sweet smells on a humid Mississippi afternoon. I lived in Mississippi for six years–this perfume takes me right back to lingering afternoons on the balcony of City Grocery (any Oxford, Mississippi folks out there? ), gin and tonic in hand, laughing with friends at the close of a long day. This comes is several sizes and forms, but I’d be most likely to purchase the $25 perfume spray. I rarely finish a full bottle of perfume so small versions are perfect for me. Final Word: September was yet another great month for Play! by Sephora! 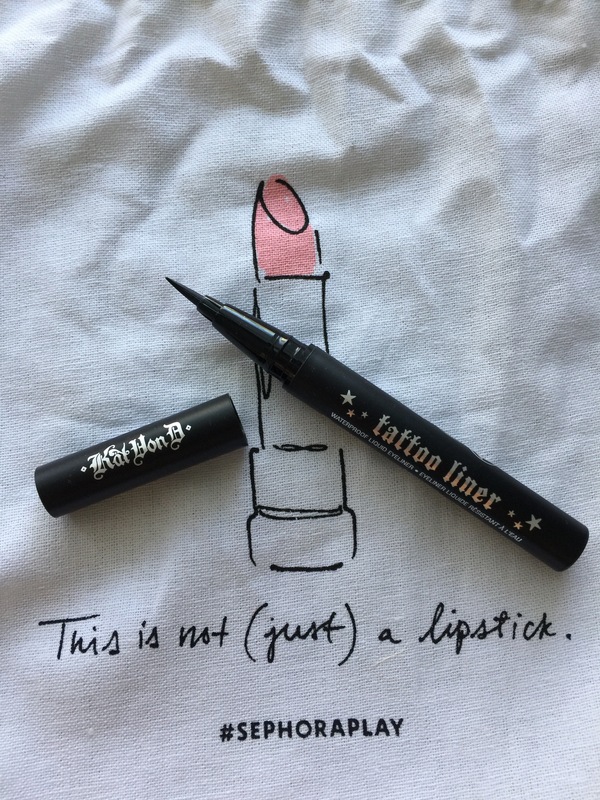 I will be picking up the Kat Von D Tattoo liner when my sample runs out, and probably a small bottle of the Atelier Cologne perfume. The other items were definitely good, but not on my must-own list. At least not yet. I’ll update you if further use changes my mind! I completely agree about the tattoo liner. Never has a wing been easier to create for me. It’s my holy grail eyeliner! I was so impressed, and I really didn’t think I would be! I love it! Awe this is such a cute theme!! The brow gel is HANDS DOWN the best brow gel there is, nothing compares! Thanks! And I agree, I loved it. And the silver packaging is just so pretty!